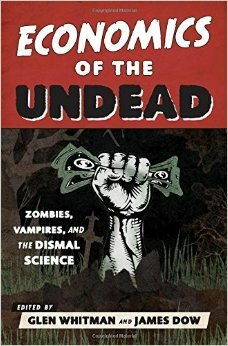 If you’re a fan of Buffy the Vampire Slayer, True Blood, or The Walking Dead and you have to take an Economics class at some point, you should definitely check out Economics of the Undead. The book explains basic economic concepts through the lens of popular books, movies, and television shows about vampires and zombies. Be a step ahead of your classmates and learn about the role of choice in economics by analyzing Buffy’s relationship with Angel. Get a better grasp on the broken window fallacy by relating it to the zombie apocalypse. Twenty-three chapters look at subjects like this while referencing Zombieland, Twilight, The Vampire Chronicles, and more. Whether you’re completely new to economics or an expert, this book is guaranteed to be a fun read. But be warned: spoilers abound. This entry was posted in new stuff tuesdays and tagged economics, economy, new stuff, vampires, zombies. Bookmark the permalink. If only there were a “thumbs up” option!